The first step in the design process, is to select the hardware to be used during construction. If you have a selection of hardware that you use most often, you can set the controls to that set and push the Set Default Selection button, and that set will show up for each new design when this form is displayed. 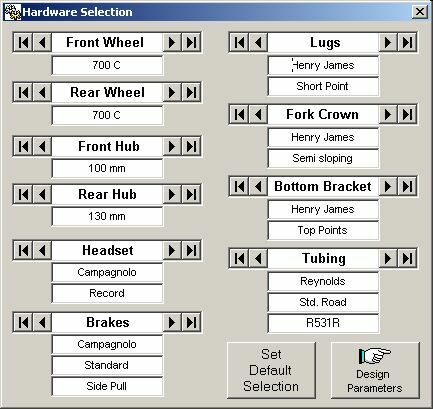 After a design is saved, the hardware selected for that design will be displayed instead of the default selection set. You may return to this form any time during the design process to make changes.